If you are on a yarn diet, you should probably not view this entry. As my current project is boring to photograph at this point, here’s some of my recent stash enhancement. Dream in Color Smooshy sock yarn in colorway Good Luck Jade. Aside from being a beautiful to look at, this yarn smells incredible. Clean, like soap, but also spicy. I have no idea what it is from, but I keep putting the yarn up to my nose and inhaling deeply. Araucania Quellon in color #3. If you can’t tell from the picture, it is chenille, and I’ll be combining it with Knitpicks Suri Dream in Ocean Heather to make the Squiggle Shawl from Magknits. These beauties will be made into another Shetland Triangle. 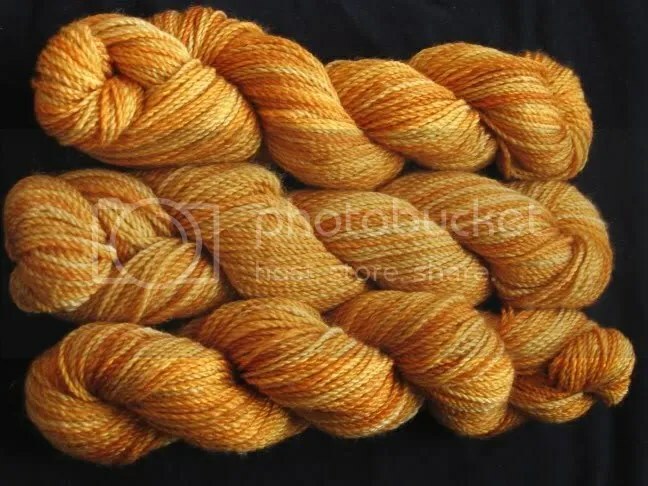 They are Artisan Merino and Silk in Aztec Gold from Ball and Skein. Blue Moon Fiber Arts Socks that Rock Lightweight in Pirates Booty. No idea what it will be made into yet, but my oh my is it pretty to look at. Two more BMFA Sock that Rock Lightweight, this time in Tlingit and Count Cluckula. They will be turned into the Chevron Scarf from Last Minute Knitted Gifts. 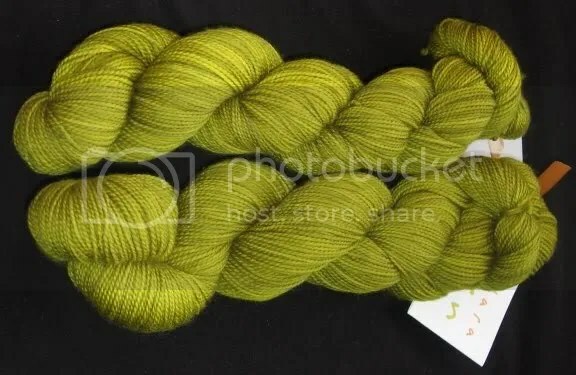 Sundara sock yarn in Green Tea. The color on Sundara’s site was much more sedated, but in person these skeins remind me of supercharged green tea. And that’s a good thing. Soon to be the the Tuscany Shawl from No Sheep for You. And finally, a yarn by a small company I had never heard of, Doodlebirds. This is their sock yarn in Tiger Lilly. 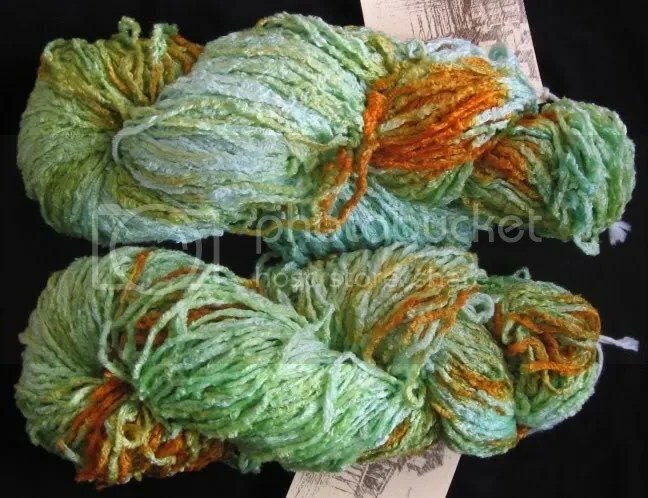 Tiger Lillies are my favorite flower, and I love orange, so when I saw this yarn I was a goner. It is so soft. I had planned to make it into a pair of socks, but I don’t think I can hide this yarn away on my feet. Lately I’ve had a number of new people coming to my site, but no one is leaving comments. You should do that! I don’t bite. Hard. That Tigerlily is gorgeous stuff. 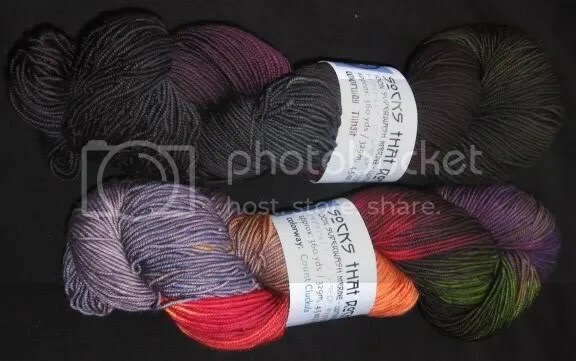 Doesn’t go with a thing I have to wear so I’ve been able to resist buying some even though I went to the web site and stared at the skein she has in stock. Somebody buy it quick and put me out of my misery. I really don’t need any new yarn. I have a ton of sock yarn, but really don’t like making socks for myself, although I like making them for little ones. I’m always looking for ideas on other things to do with the yarn, and I like your shawl plans. And I really like that Doodlebirds yarn, I’m going to have to go look at that. I love Doodlebirds’ stuff. I’m on a yarn co-op she runs and she’s going to do her own yarn very soon. I’m having to fight the temptation. Oh my! The colors are yummy! I especially like the Blue Moon Fiber Arts yarn and can’t wait to see what you make with all of it.